These old fashioned Easter cookie recipes make colorful, shaped cookies for your holiday table. 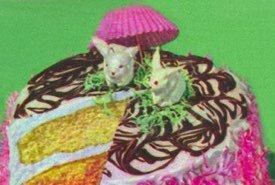 Imagine setting a tray of delicious vintage treats before your guests: cookies shaped like yellow bonnets decorated with green leaves and delicate pink flowers, and spicy cookies shaped like Easter Bunnies. The fancy cookies are perfect for serving with homemade ice creams. I can still recall Mom making them at Easter time when I was little. They made our holiday time extra special. You can even get your kids involved in making them. 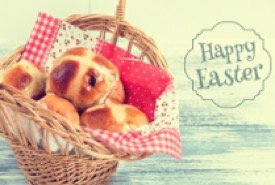 They'll have a great time making their bunnies and decorating the bonnets. Not only do these vintage Easter cookies look great, but with their all-natural ingredients they taste good too. Everybody loves them, and they're always a big hit with the kids. If you don't have a bunny cookie cutter handy, just trace the rabbit's outline using a sharp knife, as it will look fine after baking. Method: Sift the flour, baking soda, ginger, cinnamon, cloves, and salt onto a large piece of waxed paper. Blend the egg with sugar and shortening in a bowl until fluffy. Beat in the vinegar and molasses, then carefully roll up the wax paper and stir in the flour mixture until it's smooth. Knead the resulting dough into a ball, then wrap and chill for a few hours. Once the dough has cooled long enough, you can preheat the oven to 375°F (190°C). Roll out the dough onto a floured wooden surface until it's about 1/8 inch thick. Then use a bunny-shaped cookie cutter to shape cookies to go into the oven. Bake the cookies for about 5 minutes and remove from the oven. Allow to cool completely before serving. 1-1/3 cups soft butter, 1/2 cup lightly packed brown sugar, 2-1/2 cups sifted all-purpose flour, 3 cups sifted confectioner's sugar, 3 tablespoons milk, 1/2 teaspoon vanilla, yellow food coloring, 18 large marshmallows halved, food coloring -- yellow, green, and red. For this novel Easter cookie recipe, beat 1 cup butter until it is creamy, slowly add brown sugar, beating all the time; add flour gradually, turn dough onto floured board. Knead dough until it begins to crack, then roll to 1/4 inch thick and cut in 2-1/2 inch rounds; place 1 inch apart on ungreased sheet. Bake at 325°F about 20 minutes; remove and cool on rack. Makes about 3 dozen cookies. Beat remaining 1/3 cup soft butter until creamy, blend in confectioner's sugar with milk, add vanilla, and mix for frosting. Divide frosting in 2 equal parts; tint one part with 1 or 2 drops yellow and divide remaining portion in 2 parts. Ice each cookie with yellow, place a marshmallow half, cut side down, atop each iced cookie while the icing is still wet, arrange to resemble crown of bonnet, and ice marshmallow with yellow frosting. Use 1 or 2 drops of green in one part of reserved icing; tint second part with 1 or 2 drops of red to make pink. Use green and pink frosting to decorate bonnets with flowers and leaves. For this chocolate Easter cookie recipe, heat chocolate chips in a pot over hot water until partly melted. Remove from heat and stir rapidly until entirely melted. Add remaining ingredients. Mix thoroughly. Drop from teaspoon on waxed paper. Cool until firm. Makes about 3 dozen.